I came across an interesting article on the BBC which I thought would be an appropriate prelude to today's entry. Eat Less while Eating More talks about a new study by scientists of the British Nutrition Foundation who found that meals consisting of high water content foods tend to keep us feeling fuller for longer. The finding is that foods such as whole grains, yogurt, and those good old fruits and vegetables are digested slowly when compared to calorie dense, low water content foods such as peanuts, processed food products and candy. In addition, by replacing what's on our plate with mostly fruits and vegetables, we would consume a larger volume of food but less calories. Sounds familiar, no? It is the age old advice for healthy living: eat more fruit and vegetables. An easy way to do so is to slip a couple extra servings into everyday meals. Such as this salad. It is teeming with cucumbers, red peppers and sweet, fresh mango. Like most salads, you can substitute whatever you happen to have on hand. Pineapple or chunks of peaches would definitely work, as would diced carrots or even fresh tomato wedges. 1. Set a large pot over medium heat. Add vegetable oil, ginger, shallots, and star anise. Saute until shallots soften, about three minutes. 2. Add the cous cous and stir well to thoroughly coat each bead with the shallot mixture. Cook for an additional two minutes, until the cous cous browns slightly. Pour in the vegetable broth, stir and bring to a boil. Cover, reduce the heat and simmer until all of the liquid as been absorbed, an additional seven to eight minutes. 3. Meanwhile, prepare the turmeric dressing by combining all of the ingredients. Refrigerate until read to use. 4. Once the cous cous has cooked, discard the start anise pods. 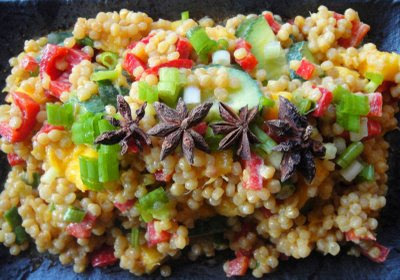 Toss cooked cous cous with cucumber, mango, red pepper, cilantro and turmeric dressing. Refrigerate until ready to serve. I completely agree on the philosophy of eating less while eating more. We have water melon these days in Turkey, and I generally eat it with some cheese near it for lunch or dinner. It makes you feel full for a long time, and it has the lowest calories among other fruits. Your cous cous salad sounds so healthy and fine with its low calories. Thanks for the comments about the colors. One easy way I find that helps me eat healthy is having a variety of colors on my plate. Never had watermelon and cheese together; what an intriguing combination. It sounds like a great summer alternative for nuts or dried fruit on a cheese plate. What an exciting & lovely meal this is! I appreciate all of your comments Miranda, Bergamot, Mel, Anonymous, and Sophie. Miranda, I hope when you make cous cous again that you like it. The first time I tried the smaller type, I wasn't too impressed. I much prefer this larger Israeli variety. Oooh this looks DELICIOUS! I'm keeping this recipe -thanks! Absolutely vibrant colours! So summery.